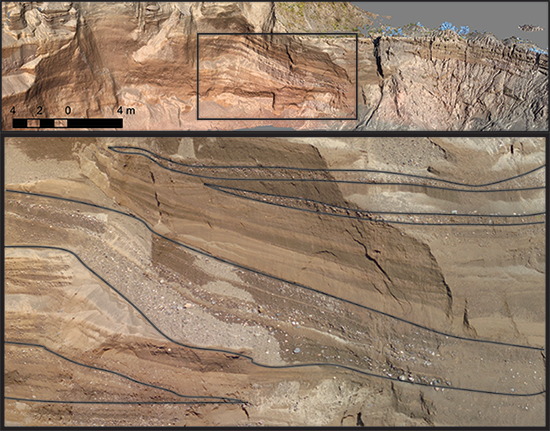 Here are six ways that drones are making their way into geosciences research and industry through innovative applications. Fig. 1. 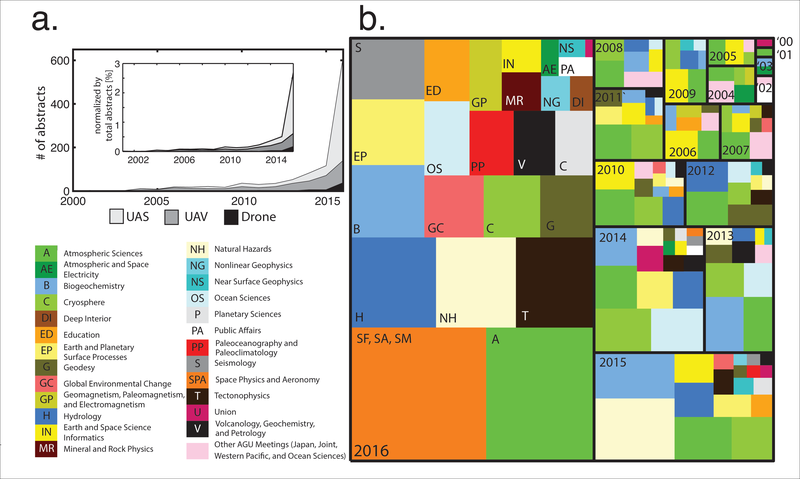 The number of American Geophysical Union (AGU) abstracts that contain the term “UAS,” “UAV,” or “drone” (a) through time and (b) visualized as a tree diagram, with the size of each square depicting the number of abstracts per year from 2000 to 2016 and color indicating different AGU sections. Data for 2017 are currently being generated. Click image for larger version. Drones are particularly useful for acquiring imagery or measurements over locations that are hazardous or difficult to reach on foot. Tracking leatherback sea turtles via drones enables professionals to follow the turtles to locate and observe their nesting sites. Christa Kelleher (email: [email protected]), Department of Earth Sciences and Department of Civil Engineering, Syracuse University, N.Y.; Christopher A. Scholz, Department of Earth Sciences, Syracuse University, N.Y.; Laura Condon, Department of Earth Sciences and Department of Civil Engineering, Syracuse University, N.Y.; and Marlowe Reardon, Department of Television, Radio, and Film, Syracuse University, N.Y.
Citation: Kelleher, C., C. A. Scholz, L. Condon, and M. Reardon (2018), Drones in geoscience research: The sky is the only limit, Eos, 99, https://doi.org/10.1029/2018EO092269. Published on 22 February 2018.